***updated 11/20/12.. I am now offering a newly designed PDF download of the tree cone patterns (5 sizes in one) and detailed tutorial for making fabric covered poster board tree cones. 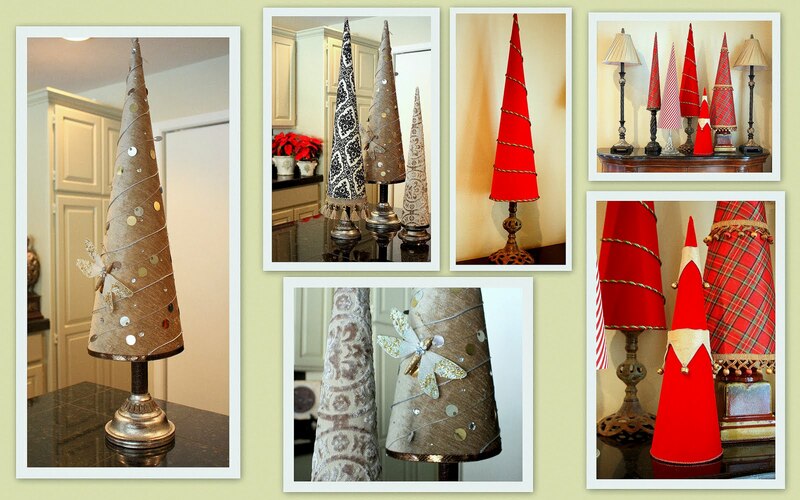 I have redesigned and made it so much easier to create fabric covered cones. You can see the latest information here. 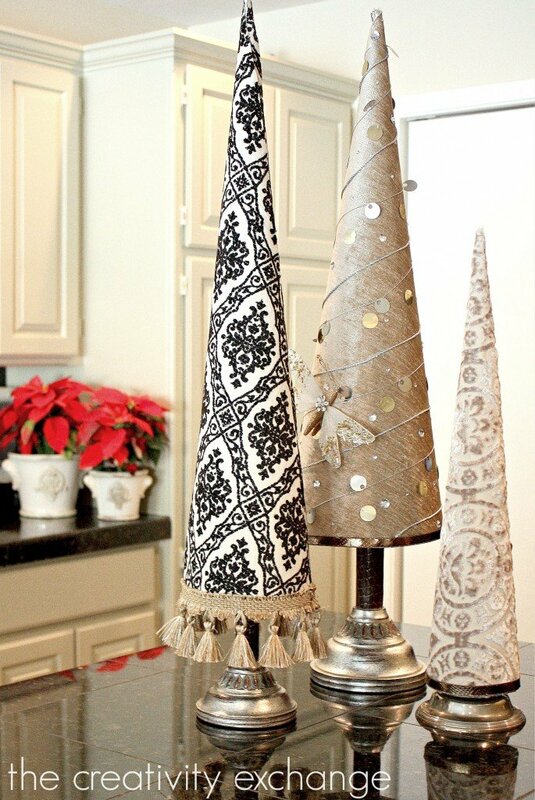 I absolutely LOVE the fabulous and whimsical fabric covered Christmas cone trees that I have been seeing in stores this Christmas season. I fell in love with a BEAUTIFUL set of these trees at Neiman Marcus in Houston and wanted to buy them until I saw that each tree STARTED at $85.00! Yikes!! When I lifted one of the trees up to look a little closer, I realized that these fun trees were just cardboard that had been rolled into a cone and adorned with fabric and trim! These cone trees are super sturdy and I will be able to pack them away by covering in tissue and stacking them on top of each other and use them again next year. I used several different types of fabric and found that upholstery/drapery fabric worked the best. There are so many endless possibilities with these cones! ***updated 11/20/12… This post is two years old and has been updated and I am now offering a PDF download of the cone patterns (5 sizes of cones all in one pattern) in my online shop. Included with the template download is a new tutorial which is different from the old tutorial here that I posted two years ago. I designed the template download in a way that we can now attach the fabric to the poster board first using pattern guide lines the rolling and securing the tree cone. The template and tutorial download eliminate several steps from the old tutorial and it is so much faster to create fabric covered cones. You can find out more about the templates here. I’ll be posting some more fun Christmas projects in the next week, so please check back! Enjoy your Christmas crafting! 6) Cut several short strips of packing tape and have them ready to grab as you begin rolling your cone. 8) Once you have a good point at the tip of your cone and point #4 is completely tucked in the roll, secure the cone with packing tape vertically from the tip down to the bottom over the board edge. It took me a couple tries before I got my cone rolling down pat and now I can do it in my sleep! 9) To make a middle size cone, repeat the above steps but cut 4 inches off of your measuring strip. To make a small size cone, cut off 4 more inches off of your middle size measuring strip. I made 3 templates and now all I have to do is pull out my template to trace and no longer have to use a measuring strip. 1) Once you have your cone ready, lay out your fabric on a large surface. Again, keep in mind, upholstery/drapery fabric are ideal, heavy cotton is ok and velvet and stretchy fabrics are very challenging. 3) With a black sharpie, trace along the base of the cone onto the fabric and then gently turn your cone and trace again (if you’ve ever done a fabric cover for a lamp shade, it’s the same technique) You will do this until your line/edge of your cone has made a full circle. 4) As you turn your cone to trace, watch and hold your tip so as your turn your cone, the tip of your cone also turns on the fabric as it would naturally roll as well. Like this. 5) Trace your cone until the edge/ line of the cone has made a full roll and draw a line on the fabric from the bottom to the tip to show where you should cut the fabric give an extra inch or so). 7) Go outside and spray your cone completely and heavily with a good spray adhesive. I use Treehouse and it is awesome! Be sure and spray well, especially the tip. 8) Place your sprayed cone onto the fabric at the same position where you started when you began to trace onto the fabric. 10) Now begin gently rolling the cone around the fabric, slightly pulling down and watching that you do not get creases. If you are using an upholstery fabric, you will not have to pull much and it should just perfectly roll and stick onto your cone. 13) Trim any excess fabric around the base of your cone to get a perfect line around your base. 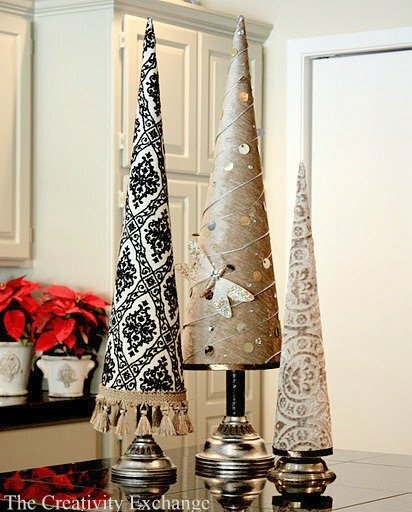 14) If you are using a pattern fabric that you do want to position on the tree a certain way, place your cone on your fabric in the middle of fabric with 1/2 inch extra at the tip and draw your line at the base and then roll half way to the right and draw your line at the base (draw line from base to tip as well). and then go back to the middle and then roll half way to the left and draw your line at the base and draw a line from base to tip and cut your fabric. 1) You can trim your tree with anything! Fabric trim, Christmas cording or anything! 2) Use a glue gun to begin gluing your trim at the tip of your cone on the backside where the line of the fabric is (this will be the backside of your cone). 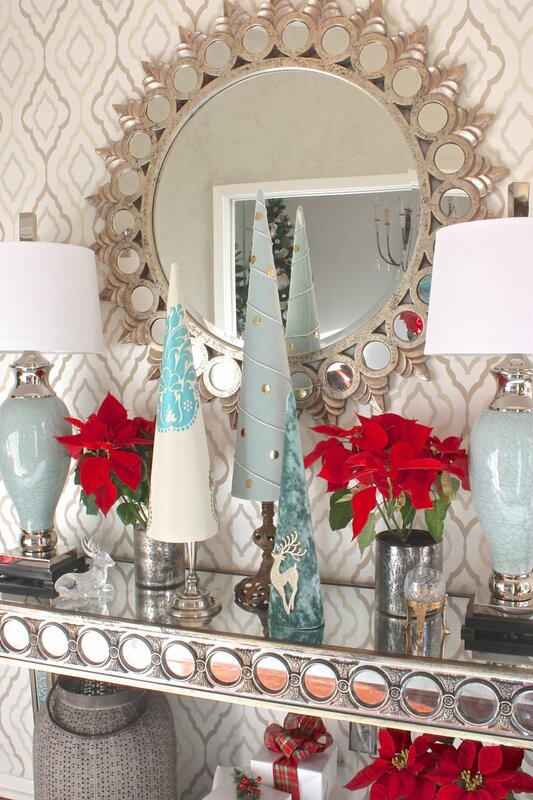 3) You can either trim diagonally down along your cone for a sloping garland look or vertical, glueing every so often. 4) I think it looks more finished to add cording or trim around the base of the cone. 5) No more steps, get creative and have fun! That’s it for now!! 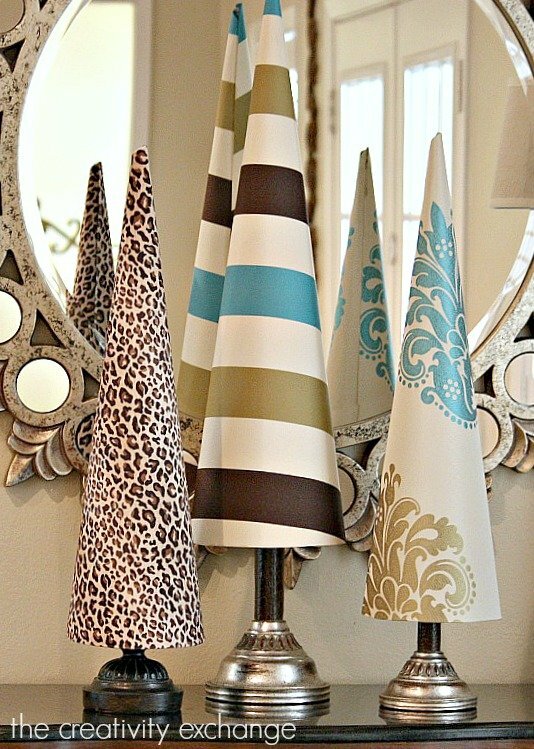 Enjoy making your fabric covered cones and I would love to see pictures of your finished creations! So fun! « Children’s Table and Chair Revamp- Decoupage with Fabric! Fascinating!! I love it! One question. And this might seem obvious. But how did you attach the tree to a base if the inside is hollow? Thanks for sharing your creativity! Emily, I just altered my post to better explain the candle stick base. I also included a picture of the holders without the cones. The cones fit perfectly and snuggly over the holders. Thanks for your comments and stopping by! These are awesome! Not having a Neiman Marcus nearby I haven't seen anything like that. Of course now I can't think why in the world I was making a cone… Right! Party hats. Anyway, this method is much better. I can't wait to try to make these. I LOVE LOVE LOVE them!! So unique, and you put really nice patterns together! Thanks so much for sharing the instructions!! What a gift…hope I have time to try one!!! Hugs Giggles witn sincere thanks! I love this idea! I've been looking for tall cones to make trees with but haven't found any that are big enough. I use heavy magazine/catalog/unwanted mail to make my cones. I'll read your tute carefully to see how I can make mine sturdier. Thanks for the tute. Also, thanks.so.much for the eye candy ideas. Your pic really get my creative juices flowing!! What a cute idea! Thanks for sharing the tutorial. Tooooo cute! Great tutorial!Thanks for sharing!! A-DORE! I made my cones this way, but hung them as cones. 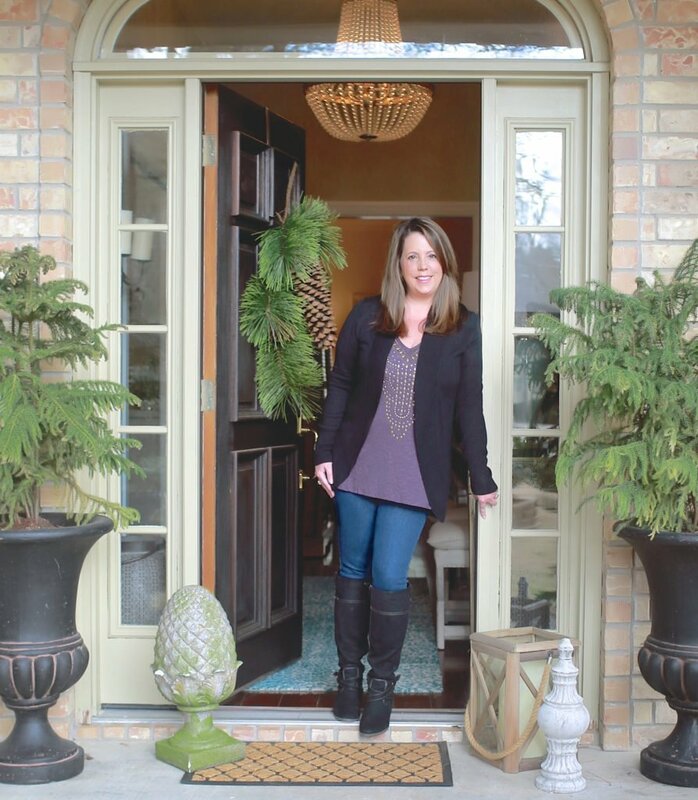 This has my vote – a winter wonderland that you can change up on a whim. Very cute and so simple! Come check out my 12 days of Christmas crafts. Now following! Can't wait to see what else you come up with! These are really beautiful! Great idea! These are absolutely gorgeous! I can't imagine anyone spending $85 on them when you can make them for so much cheaper. All your trims and accessories make them so perfect! I love this! I am adding it to my to do list and featuring it on my blog I love it so much! Thanks for the inspiration. I'm now following you. girl you were not joking and kidding around with your cone trees were you! they look amazing! I just popped by from tdc and I recently "attempted" trees like this…although nothing like yours! nice work! what a fantastic idea! I 100% love it and I think I might have to try it for my front hall table. I already have some trees there but I think 1 of these would be a great addition! Thanks! They are all so lovely. Especially the one next to the bed with the pom pom trim. What a wonderful idea to make these. Thanks for the inspiration and Merry Christmas! Way cheaper than buying the paper mâché ones at hobby lobby on sale too. Great idea and very nice. you ARE a genius! what a fab idea! and they look amazing and super expensive. thank you for sharing this. thank you! thank you! These turned out super cute! Beautiful! Great tutorial too! Thanks for sharing! Great, creative idea, and one I'm going to try! I love these sooo much. Especially sitting on the candlesticks…I want to run out tomorrow and make some. And I just might….. Your choice of fabrics and trim make these truly special. In another's hands. I'm sure they would not have turned out so incredible. Beautiful! Oh my these are amazing! I just called my sister and told her she has to make these! Thank you so much for the tutorial. this is great, i bought some paper mache trees from hobby lobby and covered them with paper, but i was limited to the size the store sold. with this i can make them as BIG as i want. thanks for sharing. These are absolutely gorgeous, thanks for sharing! This is awesome! Totally trying this out! Love the black and white tree….thanks for the tutorial! Very crafty! I love them all! Too Cute! Thanks for sharing how to make them, it's the best way to blog!! These are SO cute!! I love that you figured out how to make them yourself. This is so inventive. Love it! those all turned out soooo gorgeously! wow i love them all! Awesome job! AWESOME! Off to get some poster board! Fantabulous! Very thorough tutorial also. Thank you! These are great! I have a stash of fabric samples and more that would probably work good for this project! Thanks for the tutorial, too. Oh yeah, here's one more WOW, those turned out FLIPPIN COOL as heck. I LOVE them, LOVE them I tell you. Please come link these to my Christmas party **6 weeks 2 JINGLE** I JUST HAVE TO HAVE THEM there. I must make me a little forest, of them, THANK YOU so much for a GREAT tutorial. I also LOVE your blog, and am super happy I found you,,, I am your very HAPPY newest follower…. Love this! I found your blog through CSI Project. I'm your newest follower! how lovely, and what a great tutorial! thanks for sharing! Love this idea sooo very much! Thanx for sharing! Love these! Featured them on my blog! Love your sight!! I am a new big fan.. I featured these on my sight with a link to yours.. Beautiful. Wow! these are wonderful!! So glad I found your blog!! Been meaning to stop by as I keep seeing you featured everywhere!!! Love the scale and the fabrics you chose. You made it look so easy to make. Beautiful! Guess I will not know until I try it huh? Beautiful tutorial! I now know what I can use all my extra fabric for. Thanks for sharing with us! Thank you SOOO much to all of you!! I have tried to keep up with sending emails back to each of you but I confused myself with who I have emailed! !Hopefully I will figure it out! Thanks again, I am so blown away! Thank you for the FABULOUS tutorial. I have wanted to make one of these but thought that I would have to buy one of those paper mache cones from the craft store that cost $1.99 each…and well, I'm just too frugal for that. Thanks so much! These are awesome, and I just bookmarked your post. I am going to go through my scrap bag, and the boys and I will be making these later on. Thank you for this great idea….you just got yourself a new follower. I can't wait to see what you do next. I made Danish Christmas Hearts and Paper Christmas Stars to cheer up our tree. Thanks for the tips, especially the string compass! I made a couple of cardboard trees using a surprisingly large piece of cardboard I found after finishing a roll of wrapping paper. The string worked great. I just made some and I'm getting ready to post them on my blog, come by and have a look ! Very cute! I hope I get around to this porject soon! I would imagine that if you got some iron on interfacing to back your cotton fabrics with they would roll onto the cones as easily as drapery fabrics. Thanks for sharing the tutorial as well as showing the before/after on the tree stands. Love this! Thank you so much for the tutorial….Can't wait to try one myself and I want to share on my blog with a link to back to you. Perfect way of using those old candlesticks that have been put away….I'm thinking of a grouping for Halloween…spidery material….black feathers…..bling…. Thank you Thank you Thank you!!!!! I love this idea. I am soooooo going to try this. Fabulous idea! I can't wait to make these! What a $$ saver! Thank you so much ladies! I'm thrilled that you are going to try these! You won't be sorry, they are so fun to have grouped together. I warn you, it's addicting once you start making them. These are GREAT!! 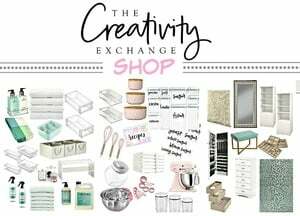 Just found your site and can't wait to browse it some more!! Like the Dragonfly on one of the trees…did you make or just buy and place on there? Thanks, Carrie! Love the trees, can't wait to make my forrest! Just found your site via Tatertots and Jello and I LOVE it! I'm looking forward to making these trees and trying the screen print pillows. You are definitely the inspiration I needed to get off the couch and craft again! Thank You!! Great tutorial! It’s not easy to write a tutorial and get down to the very basics so those of us (me) who are a bit slow can follow along quite nicely! Well done! I have a couple of questions but I’m sure you’ve already tried all of this. Instead of using the 2″ length of paper as a guide still use the push pin but use string with a Sharpie attached to create the pattern (make a string compass)? Also, would it not be easier to leave the poster board pattern flat and then cut out the fabric with that pattern then shape the poster board into a cone? Would have to remember to have extra fabric so fold over. I tried this with my smaller version (compass pen style) and it worked well. I think I would be tempted to add the fabric before rolling the cones. Any reason that would not work? You have done this and I haven’t so I need your input. Looks like I could just trim around the bottom with something and not have to fold the fabric over the inside. Would that work? OMG! Love. Can’t wait to make. To make the cone sit higher on a shorter holder, I would cut a circle out of foam board and glue it to the top of the holder. That way the cone sits on the foam board circle rather than resting on the holder itself. You can adjust the height of the cone on the holder by adjusting the size of the circle that you cut. Cut larger, cone sits higher, cut smaller circle, cone sits lower. Hope this is a helpful hint! Well isn’t that smart!! What a great idea! Thank you so much for sharing it with us! I don’t know if anyone mentioned this, but you could use iron on interfacing to stiffen your woven cottons to make them easier to put on. Absolutely beautiful.Love the natural tree with dragonfly!So many different looks and options.Thanks for posting. These are lovely….I do not sew, so I did not have scrap fabric. I am a scrapbooker and I had some decorative paper; so I made a smaller version and made three cone trees with co ordinating paper. I placed them on my existing candle holders and the look fabulous!! If I knew how to post a photo, I would surely do so. 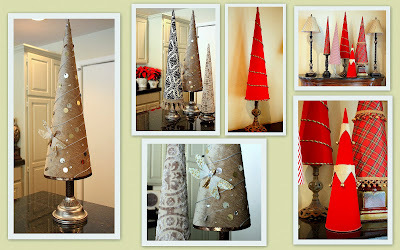 I would like to try the fabric cone trees, but this was a quick, easy, cheap and lovely project. I’m just curious how much fabric you would need for each cone/tree? I host a monthly Pinterest GNO and we are making these next. None of us are crafty but we all are now thanks to Pinterest! As far as fabric goes, for the large cone I would say you would need a little bit more than a 3/4 yard with a lot of fabric left over. You need enough to completely roll it around. If you make your cones narrow, you can do it with a 1/2 yard. For the medium size you can get 2 or 3 medium cones out of a 1/2 and for the small cone you can get 5 plus out of half yard. Again, because you need the length and you have to roll, it’s an odd shape and takes more of the length of the fabric but you can use the left over fabric for other sizes. I hope that helps! I would love for you to send me pics of your party and finished cones! Thanks for visiting Debbie!! I’m in the process of making these and am wondering how you made the tip look finished? I haven’t started with the spray adhesive yet but am afraid I’ll have a funky shape at the tip. Anyway, I’ll go give it a try and see what happens. Yours are very beautiful – hoping mine turn out as well! Thanks!! Hi Tanya! I hope you figured it out, just got to my emails. You probably know by now that your poster board tip does not have to be perfect or even close to it. Once you roll your fabric around, you will make a perfect fabric tip. If it’s not perfect, tuck and glue and work with it! Have fun! I just love these!! I pinned it from Pinterest and am going to get going w maybe a few for Valentines and then Easter covered w grass and eggs . Love your site too. Great job…so much talent! Have you tried cutting the material with the same pattern as cone and gluing the fabric on before rolling the cone? I’m sure it would take a little more material, but I’m wondering if it might be easier to cover. Any thoughts? I think you might not have as smooth a finish this way. Did you try it? Yes, I have tried covering the poster board with fabric and then rolling but I have found it doesn’t work as well because you have to attach it somehow and I felt like taping it prior to covering with fabric holds the cones together better long term. The only way to attach after rolling with the fabric on the poster board would be with hot glue and it’s hard enough to hold the cone together after you have rolled it, let alone trying to hot glue it if that makes sense. The tape allows you to instantly hold together your cone shape. Thanks Kate! Love these! Thinking they’d be great sitting on an urn as well. I’m thinking I’ll make a fabric template out of poster board too, so I can have a pattern and not have to roll to cut the fabric each time. I like to. Work on a handy piece of foam board far many crafts, so the push pin corner would be easier! I see these becoming an obsession, so I’m planning ahead to make multiples! I loves these! I am going to definately give it a try. So I understand they are sitting on any type of candle stick with a pretty base? What a great idea! I think I will make some of these for my display tables. So cute!! I would love to know when your new templates are available for purchase. I just joined pinterst and found your site. Love this idea! Please send me an email when the templates are available for purchase. Thank you. Love these trees. Thanks Joni! The templates and my Etsy store are not set up yet but we should be in business by the end of the week. I will send you an email when the store is ready. Thank you for your interest and stopping by! Please let me know when the templates are ready for sale. Please let me know when the templates are available. Love these!! Email when the template is ready. Thanks! Love! Please e-mail when template is ready for purchase. Thank you much! Please let me know when your Etsy store is up and running. Thank you! I am interested in purchasing your templates but can’t find them on etsy. Can you give me the link please? Please email me when the templates for the cone trees are available. I REALLY love these trees, but can’t seem to find the info on the base? What is it you are using and how are you attaching them??? I must be missing something since no one else seems to be asking! Can’t wait to make some of these! I talked about in the tutorial and even showed pictures that I use candlesticks. Not sure how you missed that! LOL! If you go back and read through the whole tutorial you will see how I do it. Thanks so much Erin! Love these! Could you please tell me where I can find the templates on Etsy. I would love to purchase the template…………..please email me as soon as they are ready to purchase. Thank you. Please let me know when the templates are ready. I would love to make these! I’d love to buy the templates once you have them! You are a pinterest phenom, y’know! These trees are so pretty. Please email me when the templates are ready. Thank you! We just decorated with cone trees that were left from a store closing (their decorations for Christmas) and decided we need to replicate the idea in a smaller version for table centerpieces. We are using leftover Christmas wrapping paper. Just made them and love them! Thanks for the very precise instructions. I am having trouble with the cone tips looking completely “pointed” any ideas as to what I can cover them with? Thank you Jamie! Love your blog too and love your round-up of tree cones! So fun! Thank you so much for including me and my cones! These are trees are so great! Depending on what kind of fabric or trim you use, they can be cute or elegant. I used wine & champagne glasses as bases because I didn’t have enough candle holders. Use card stock circles or stuff the tree with paper towel if you need them to sit up higher. Thank you so much! I did them without the template but wish I would have just bought it–would have been easier for sure. Thank you for a wonderful craft project. I can’t believe that someone was selling them for the big buck that you mentioned. I made 5 for my new christmas redo and love the results. Your instructions were perfect. Thanks again. You are my new favorite craft guru. These are beyond beautiful and just what I need now that we have downsized to an apartment. Never content to just take a pattern and make it as is I have a suggestion to tweak these trees. Adhesive is expensive and difficult for me to use as I am in a wheelchair and live in cold Minnesota—so I am going to try attaching the fabric to the cone by sewing it on with my sewing machine and a heavy duty needle. So I’ll take a hunk of fabric large enough to cover the cone, sew it down with straight lines or freeform machine quilting, then cut off excess fabric. If that goes well I’ll think about adding a layer of quilt batting on the next one and get more of a 3-D effect. What do you think?